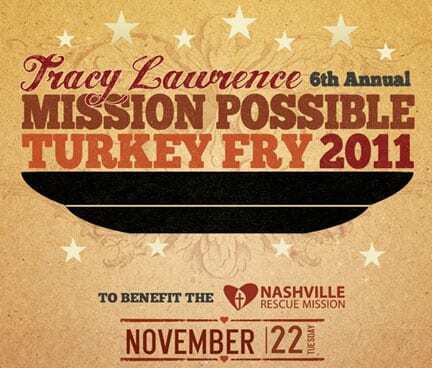 Tracy Lawrence is preparing to host the sixth annual “Mission Possible” Turkey Fry on Tuesday, Nov. 22. The event, which runs from 8 a.m. to 3 p.m., will benefit the Nashville Rescue Mission. Since the launch of the “Mission Possible” Turkey Fry, Lawrence and his friends have donated more than 5,000 turkeys, serving almost 35,000 meals and raised more than $100,000 for the Nashville Rescue Mission. This year Lawrence is getting help from his sports and entertainment friends, including 3 Doors Down frontman Brad Arnold, Restless Heart, American Idol’s Lacey Brown, The Roys, The McClymonts, and Tennessee Titan cheerleaders and football players Rob Bironas, Daniel Graham, and Jordan Babinaeux. Each of them will join Lawrence in an effort to help prepare and fry more than 500 turkeys that will serve more than 7,000 meals this holiday season. The sixth annual event will be held in the parking lot of the Nashville Rescue Mission. “Mission Possible” Turkey Fry is free and open to the public, though donations to the Nashville Rescue Mission are requested. « Do The MusicRow Awards Predict CMA Winners?